In 1916, Albert Einstein predicted the existence of gravitational waves. 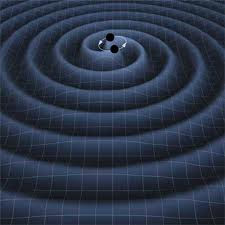 Gravitational waves are ripples in the space-time fabric. Similar in concept to how sound waves are, gravitational waves are a bit more complicated that instead of air as the travelling medium, gravitational waves travel as compressions and expansions of the fabric of space time. They may be pictured as small distortions of space-time geometry which propagate through space as waves. A slight distortion in one region of space distorts nearby regions, and in the end, there is a moving distortion which speeds along at the the speed of light. These waves have not been discovered yet but it is believed that the distortions that cause gravitational waves are from the accelaration of big masses such as supernova explosions, black holes eating up nearby matter, collisions of black holes, and coalescence of neutron stars. To date, gravitational waves have not been discovered yet but there are indirect evidence pointing to its existence. In order to prove that they exist, these must be observed and measured. For 20 years, the Explorer Gravitational Wave Detector at CERN have been trying to detect this wave. An analogy would be placing a bowling ball on your bed. As the bowling ball moves, the area where the bowling ball sinks down because of the weight of the ball. Just like that, Einstein theorizes that the dimension of space-time warps and curves as planets and other objects of big masses move along it. These curvatures generate ripples (waves) in space-time that travel outward at the speed of light and diminishes in energy as it goes further out. This is what a gravitational wave is. Gravitational waves do not need any type of matter present nearby to be generated by a binary system of uncharged black holes, which would emit no electromagnetic radiation. Gravitational waves can pass through any intervening matter without being scattered significantly. Current technology allows us to observe the Universe through telescopes and light detectors. But because light scatters and can be blocked, the information gathered is limited. But with gravitational waves, they can pass through matter unimpeded. Because of this, observing the universe through gravitational waves would bring in more data and observations never before imagined.